We are saddened by the recent news of Jane Russell’s death at age 89. Russell was a voluptuous pin-up girl, admired by millions of soldiers during World War II, long before many of those same soldiers had ever seen her perform in a film. The marketing genius of Howard Hughes brought her to the big screen in classics including Gentlemen Prefer Blondes alongside Marilyn Monroe. What few people remember about Jane Russell is that in 1955, she starred in what was to be the last film she would make under the direction of Howard Hughes. The treasure-search adventure Underwater was filmed at Silver Springs. During the heyday of Florida theme parks, Bruce Mozert created some of the most memorable kitsch photography of the era. His underwater shots of beautiful models in crystal-clear waters were sent out on wire services and helped establish Silver Springs as Florida’s premier tourist attraction. In the 1950s, his work helped lure the postwar generation to a land of fantastic, tropical, and mass-produced amusement. Silver Springs’s popularity never depended upon parrots, monkeys, alligators, airboats, water-ski shows, or models dressed as mermaids. Instead, its appeal was primarily beneath the surface of the water and cruises on glass bottom boats were the major attraction. 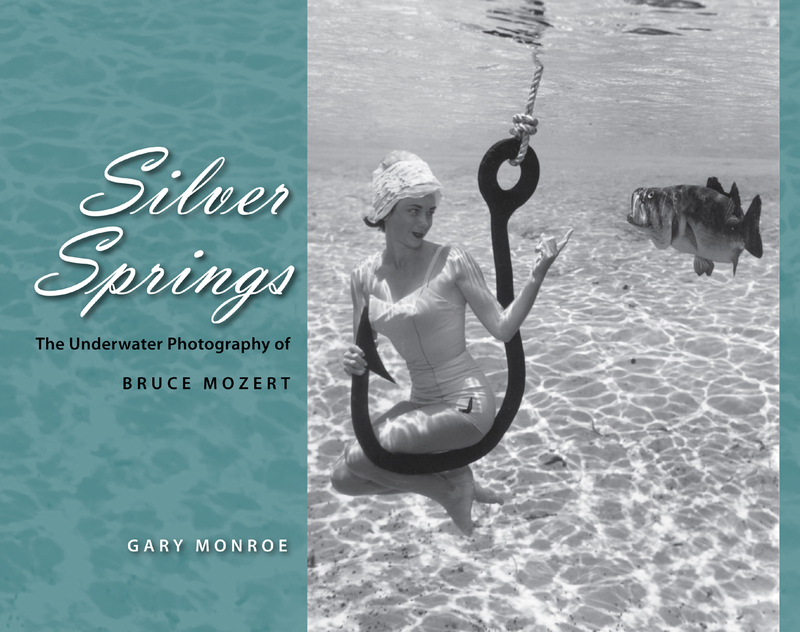 Mozert was Silver Springs’s official photographer for nearly forty-five years, and his images were designed to sell the park. No one came up with ideas as zany or as memorable as he. A model cooks at a stove, wooden spoon at her mouth to taste, while condensed milk rises from a hidden can (to look like smoke); another bathes in a tub, scrubbing her toes; yet another relaxes on a chaise lounge while a nearby air conditioner hums away. Gary Monroe has collected some of the best underwater shots by this remarkable photographer. These photographs—many unseen for decades—capture those heady times in all of their whimsical glory. Do you have an event, person, place, trend (Twitter or otherwise) you’d like us to connect to a UPF book in six degrees? Email your idea to sw@upf.com and win a copy of the book we connect to your idea!